The boys turned 8 months a couple of weeks ago. Everything is going good. Hayden now has 4 more teeth (all on top). 2 of Carson's has come in and the others are on their way. So far, we have dodged the flu bug. Carson had some upper respiratory stuff going on, but after some antibiotics and decongestant, he is doing fine. Hayden just had a runny nose. The last time I weighed them, Hayden was 19 1/2 pounds and Carson was 17 1/2. We go to the doctor at the end of this month for our 9-month checkup. At that time, I'll have updated numbers. 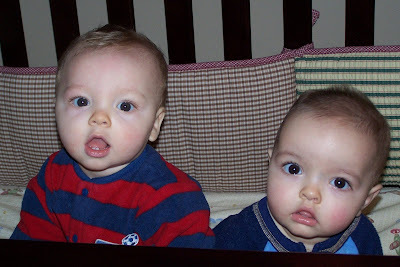 Here is a picture I took of them right around the time they turned 8 months. They like sitting in their cribs and playing, and are even starting to seem to like to play together. Of course, only when the other is not trying to take something away :). We are going to have so much fun - and so many fights. They are so precious. I hope you and Phillip are enjoying every minute of their lives. I'm sure you are and it shows by how haoop the boys are.